Last month, I posted a squirrel coloring page. I also suggested watching squirrels for a while. Science is all about making observations, after all! This month, I followed my own suggestion and took some time to watch a couple of squirrels in our front yard. They weren't rampaging about, the way they often do, but a few minutes of watching turned into a fun science mystery. 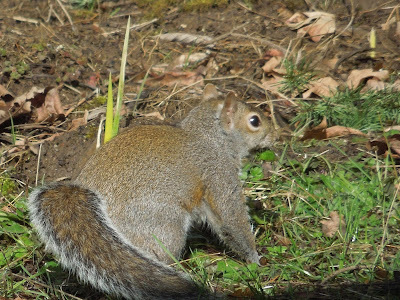 It started in early March, when I noticed a squirrel hunting through the grass next to our house. He seemed very busy about something, but disappeared before I could grab my camera. The squirrel was back the next day, and a couple days later, there was another squirrel scampering across our front steps. This one had a bit of a reddish tinge to his fur, so I could tell it was a different squirrel. Now, the squirrels love our yard. It’s time for a few science activities! After writing Who Laid the Egg? a couple years ago, I created a set of coloring pages with a few of the animals from my picture book. They’ve been posted on my blog for a while now, but I recently decided to clean them up and add some extra projects. 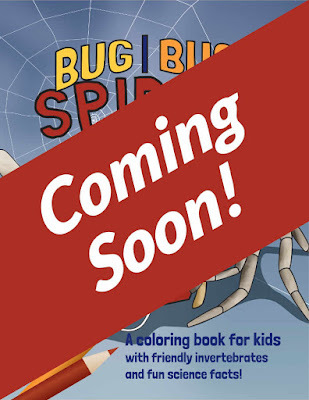 After all, I’ve been busy creating other kid activities for my new coloring book! I'm currently procrastinating on my next book, so now seemed like a good time idea to revisit Who Laid the Egg? and create something specifically for younger kids (and their adults) to do along with the book. And guess what? Here it is! I’ve created a PDF file that you can download and print. A couple of these activities are based on science projects and ideas that I’ve seen elsewhere. All of the artwork in the PDF is my own, though, and I hope you will check it out! Welcome to International Read an Ebook week! But what if you've never read a digital picture book? Chances are good that you've read at least one ebook before! Even if you don't have a Kindle device or other eReader, you've probably opened a PDF on your phone or computer to read. What about children's ebooks, though? Like a lot of parents, I prefer holding a book when I'm reading to my kids. I also love browsing picture books at the library. It's always amazing to see how many books there are, check out different illustration styles, and touch the pages. It's hard to treat digital picture books the same way . . . but they can still be a lot of fun! This project started last summer, when my family and I were watching a NOVA episode on origami. The video showed a clip of a ladybug's wings unfolding as it launched into the air. In slow-motion, the ladybug's wings slowly, almost magically, opened out from beneath the bug's red shell. At the time, I wanted to capture that moment of flight. So, I created a coloring page and shared it here, on my blog. With that small attempt, however, I found the inspiration for Bug, Bug, Spider...a whimsical collection of anthropomorphic insects! From there, the ideas grew. I took on an Inktober drawing challenge, trying to complete 30 coloring pages during October. Slowly, though, the project stretched out over an extra two months as I edited and fine-tuned the images, then added science facts and activity pages to the book. As I wrap up my current project, it's time to have another book list! There seems to be a pattern, actually. I start on a project, and we suddenly need to read dozens of picture books on the topic. 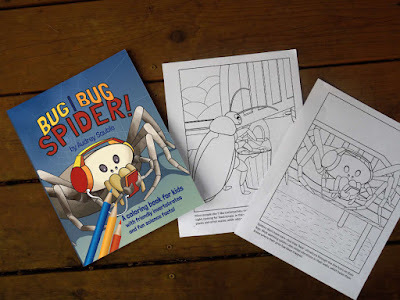 Since I'm wrapping up my Bug, Bug, Spider coloring book right now, I wanted to share some of our favorite bug books with you, along with a few extras about other types of invertebrates. I had plans for one of those year-end posts reflecting on how things have changed over the past year. I was also working on another coloring page, specifically for New Year's partying. Then, this week several minor crises hit all at the same time. So, no first-of-the month coloring page this time, and no long-winded reflections either. However, I do have a teaser book-cover for my coloring book! The proof copies for the coloring book came yesterday. I'm wrapping up revisions and planning to publish it January 19th! More information to come!